Making it easy for developers to get started on coding has always been our top priority. 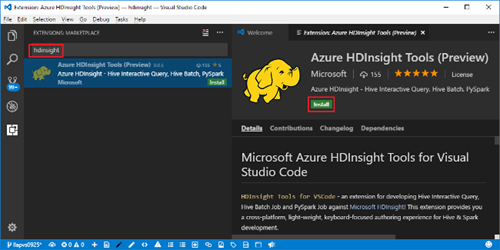 We are happy to announce that HDInsight Tools for VS Code now integrates with VS Code Azure Account. This new feature makes your Azure HDInsight sign-in experience much easier. For first-time users, the tools put the required sign-in code into the copy buffer and automatically opens the Azure sign-in portal where the user can paste the code and complete the authentication process. For returning users, the tools sign you in automatically. You can quickly start authoring PySpark or Hive jobs, performing data queries, or navigating your Azure resources. We are also excited to introduce a graphical tree view for the HDInsight Explorer within VS Code. With HDInsight Explorer, data scientists and data developers can navigate HDInsight Hive and Spark clusters across subscriptions and tenants, and browse Azure Data Lake Storage and Blob Storage connected to these HDInsight clusters. 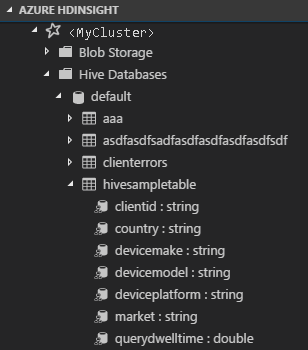 Moreover, you can inspect your Hive metadata database and table schema. Support Azure auto sign-in and improve sign-in experiences via integration with Azure Account extension. Enable multi-tenant support so you can manage your Azure subscription resources across tenants. Gain insights into available HDInsight Spark, Hadoop and HBase clusters across environments, subscriptions, and tenants. 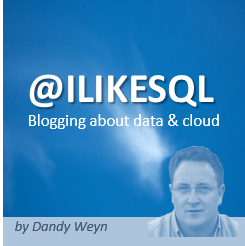 Facilitate Spark and Hive programming by exposing Hive metadata tables and schema in HDInsight Explorer, as well as displaying Blob Storage and Azure Data Lake Storage. First, install Visual Studio Code and download Mono 4.2.x (for Linux and Mac). Then get the latest HDInsight Tools by going to the VSCode Extension repository or the VSCode Marketplace and searching for HDInsight Tools for VSCode.